I haven’t posted much about my meat rabbits yet, but last weekend was “graduation day” for the latest litter of 9. My friends in America euphemistically call it “sending them off to freezer camp”. Here you can see the rabbit tractor I recently built for them. 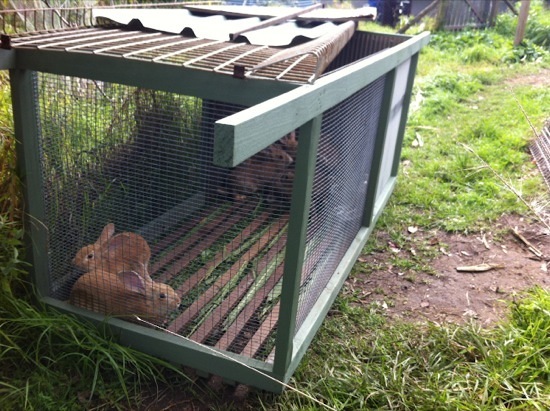 I’ll post more about it soon, but it’s loosely based on Joel Salatin’s rabbit pens. It allowed me to raise them on pasture, moving them to fresh grass every day, while still keeping them safe and secure. Here are the rabbits in the tractor, sharing a drink. They weighed about 3 kg each at this stage, and were 14 weeks old. 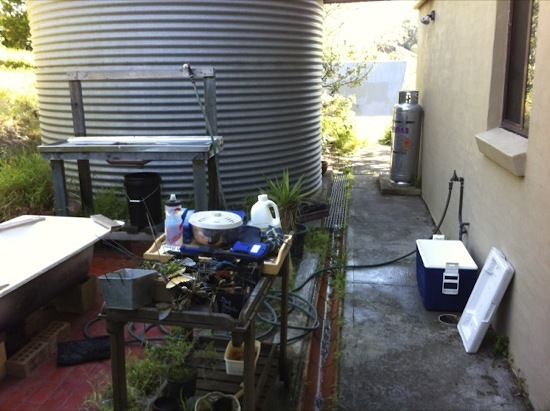 This is my small animal processing setup. I posted about the sink stand a while ago, and it’s still working great. The top is all stainless steel, and I scrub it down with bleach before starting so everything’s nice and clean. I have an esky of ice and water on standby to the right, and there’s a bucket for scraps to the left of the sink. Oh, and you can see my hillbilly hot tub on the left :-). Here’s my standard equipment for processing day. At the back of the tray you can see my knives (a boning knife, a filleting knife, and a fishing knife) and a honing steel. Knives have to be kept sharp, and I hone them in between each animal. The stainless steel butcher’s hooks on the left are for hanging the rabbits over the sink, to make the job easier. 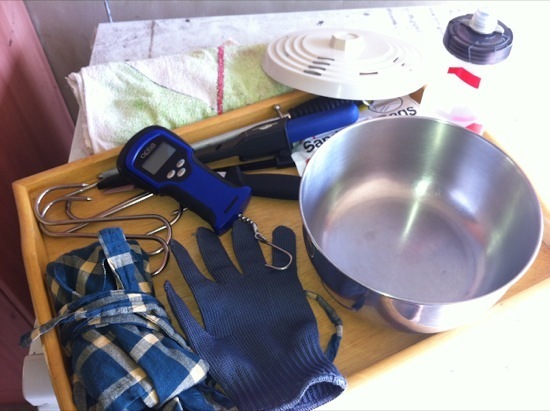 Below them is my apron, and a steel-woven glove – essential for protecting your non-knife hand. My latest addition is the digital fish scale, so I can keep track of how heavy each animal is (live and dressed). The metal bowl with lid is handy for collecting offal, and behind it are the zip-lock bags I store it in when I’m finished. And a drink bottle, because it’s thirsty work (beer comes afterwards, not during!). 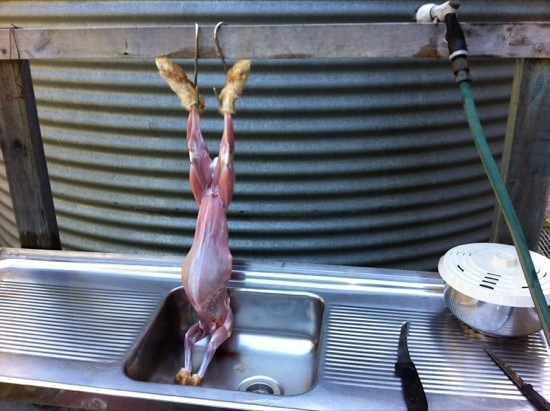 Here’s a rabbit in the “bogan” stage just after skinning – it’s got ugg boots and bare legs. The butcher’s hooks are inserted between the tendon and the bone near the ankle, for a strong hanging point. 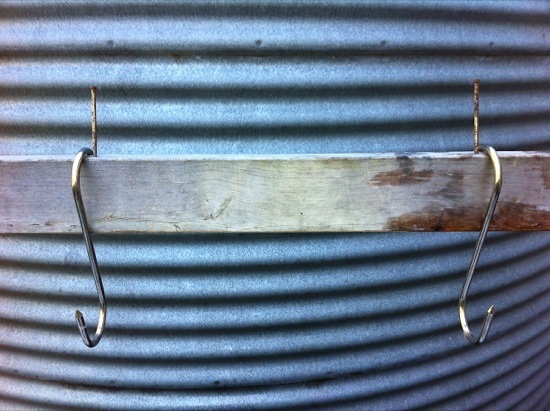 The hooks were sliding around a bit, so I banged a couple of nails in the top of the timber rail to hold them in place. This worked much better. 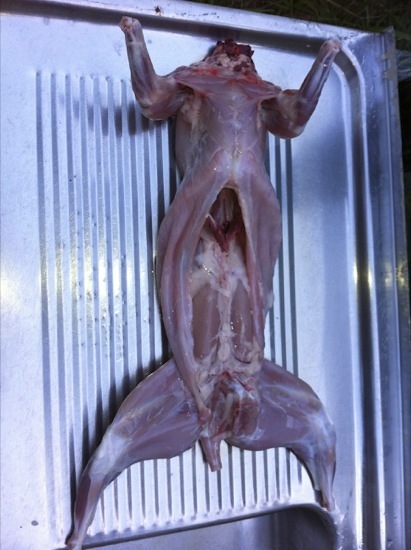 And here’s the rabbit after processing, ready to go into the esky of ice water. The first few rabbits took me over 20 minutes each to process, but by the end of the session I’d gotten a lot more efficient and had the time down to about 12 minutes per rabbit. From a live weight of around 3 kg, they dressed out to about 1.8 kg. A rabbit this size would easily feed four people in a stew or casserole – we typically get a meal for the family plus a couple of leftover lunches. I also treat myself to a liver-and-kidney lunch when I’m finished processing. Sometimes I break the rabbits down for freezing, separating the hind legs (like chicken thighs), loins (like chicken breasts), and front legs (like chicken wings). I then cook up the carcasses (along with the skirts) for stock, pulling the meat off afterwards for ragu or soup. Other times I just freeze them whole. Do you eat rabbit? 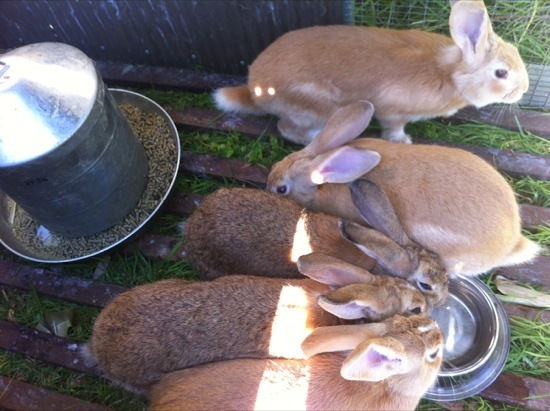 It’s not very common to raise meat rabbits in Australia, and I’d love to hear of others doing it! Thanks for sharing your experience, very interesting. You have put a lot of thought into the preparation. I really hope to get some meat rabbits eventually. Just wondering, do you feed the offal to the chickens? @Jeff: I eat the offal myself, but sometimes treat the chickens to the intestines etc. The dog loves rabbit heads and feet, although the family doesn’t like me storing them in the freezer! Some of the soft parts go in my dam for the turtles and eels as well. Whatever’s left over gets composted. I’ve kept all the skins in the freezer for now, and plan to learn how to tan them soon. Great post Darren. You have given me a couple of ideas for my own Rabbit processing. @Little Tassie Prepper: Thanks! I’m always keen to read your posts, too.